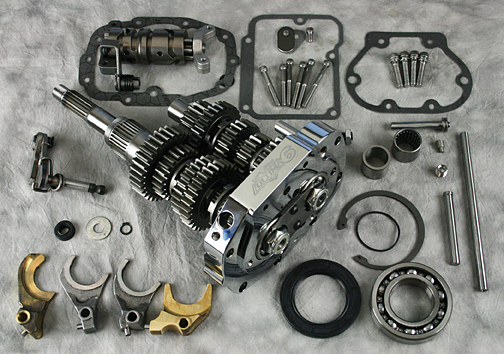 The Ultima ® Six Speed Builders Kit was designed to provide a simple, low cost, 6 speed overdrive solution for 1990/L Big twin owners. These kits work in most 1990-1999 models with little or no modification. A speedometer recalibration unit is required on some 1996-2000 and all 2001 later models. These kits will work in 5 spd type 2000/Later models with additional minor modifications. All Touring FLT and FLH Models 93/L require an oil filler spacer. all Harley Davidson ® Touring models 1990-2006. Features: Roller Detent for smoother shifting, Steel shift forks, Precision Ground 8620 Gears and shafts, Chrome Plated Billet Trap Door. McChesney Motors, LLC orders the transmission kits directly from the Ultima ® Products distributor, MidWest Motorcycle Supply. These kits can be obtained in just a matter of a few days and installed immediately in your Harley Davidson ®. Installation in most Harley Davidson ® models is $1,200.00 USD + tax. Call McChesney Motors, LLC today to schedule your upgrade.